BankBCLP.com » Did Congress Release Nearly All Banks from the Volcker Rule? But did Congress do even more than that? In December 2018, Yahoo Finance and the American Banker each ran short stories questioning whether, in adopting EGRRCPA, Congress inadvertently exempted nearly all banks from the limitations of the Volcker Rule. 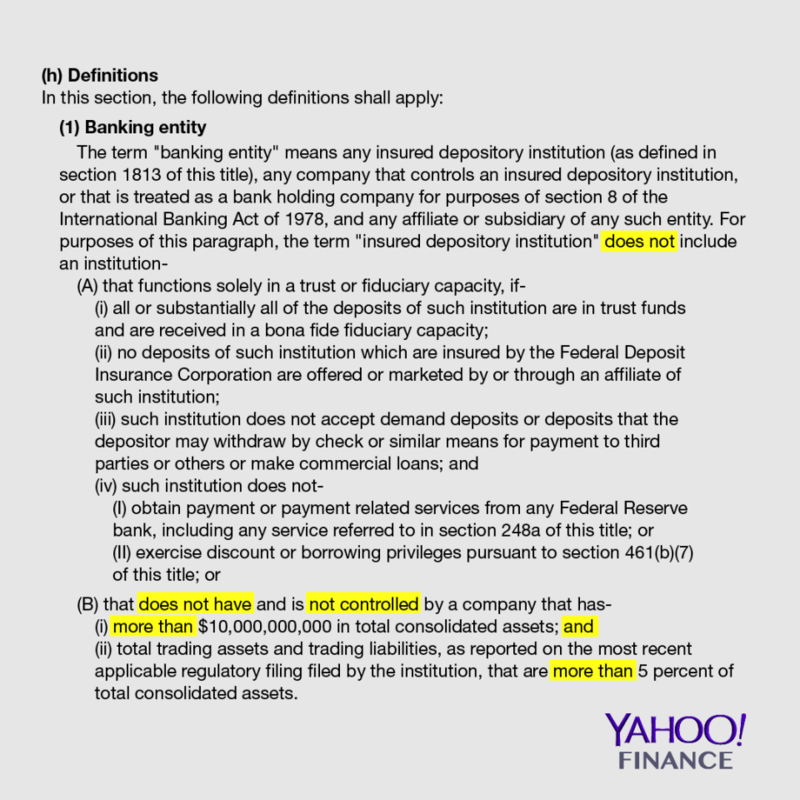 The headline of the Yahoo Finance article read “Congress may have accidentally freed nearly all banks from the Volcker Rule.” The basic gist of the article was that the statutory language included in EGRRCPA actually exempted all banks that either has less than $10 billion in assets or whose trading assets constituted less than 5% of their total assets. As only a handful of institutions have trading assets that constituted more than 5% of their total assets, this interpretation would confine the Volcker Rule to only a handful of the largest institutions. The headline of the American Banker story was a more focused on the impact on banks over $10 billion and a lot more pessimistic, “A big-bank loophole to escape Volcker Rule? Not so fast.” As reflected in the American Banker story, regardless of a literal reading of EGRRCPA, at the end of the day, institutions over $10 billion in assets will be unlikely to escape the Volcker Rule. But that ignores the fun that be had with detailed statutory interpretation and examining the actual language used in the statute. As reflected above and in the Yahoo Finance article, there are certainly a lot of negatives in the EGRCCPA provision. Under the statute, failing either A or B would appear to be sufficient to qualify for the exemption, as (A and B) is not true if either A or B is false. However, under the regulation, both A and B have to be false in order to qualify for the exemption. This could provide grounds for an institution that has more than $10 billion in assets, but trading assets of less than 5% of their assets, to challenge the statutory authority for applying the Volcker Rule to them. As noted by the American Banker story, beyond the statutory language, any court would likely look to congressional intent and also take into consideration the regulators’ perception of that intent. At the time of the legislative debate, the Congressional Research Services summarized the applicable EGRRCPA provision as amending “the Bank Holding Company Act of 1956 to exempt from the “Volcker Rule” banks with: (1) total assets valued at less than $10 billion, and (2) trading assets and liabilities comprising not more than 5% of total assets.” While the proposing release does not mention the underlying statutory language, I would note that the proposed rule is worded almost identically to the Congressional Research Services Summary of the provision. With the regulatory interpretation of the EGRRCPA Volcker Rule position matching the Congressional Research Services Summary, any bank seeking to expand the Volcker Rule exemption based on the statutory language is likely to ultimately be dissatisfied. Note 1: This is really a lesson as to why one should try to avoid double negatives at all times. Interpreting them never makes anyone feel better about the world. Note 2: I was a policy debate geek throughout college (and then coached parliamentary debate throughout graduate and law school). One frequent (usually throw-away) argument in policy debate is that the other side is not being “topical.” Usually this type of topicality argument is based on similar grammatical/logical constructions. Rarely are they pursued and even more rarely are they successful. In my last round as a debater (in a semi-final of a regional tournament), my partner and I attempted to only make topicality arguments. We lost on a 2-1 decision. I would be surprised if a court decision on this issuer were that close.